This class is designed around the Bloc-Loc Pinapple ruler. This method will teach you a fast, accurate and successful way to achieve beautiful Pineapple blocks for your projects. You will be constructing four 15 inch unfinished blocks which we will use to construct a small project. Come join us for an exciting day of learning. This class includes a 30 minute lunch break. Bring your lunch or plan to purchase locally. Pattern and cutting instructions will be provided. All fabric must be heavily starched (60% StaFlo/40% water) and pressed before cutting. 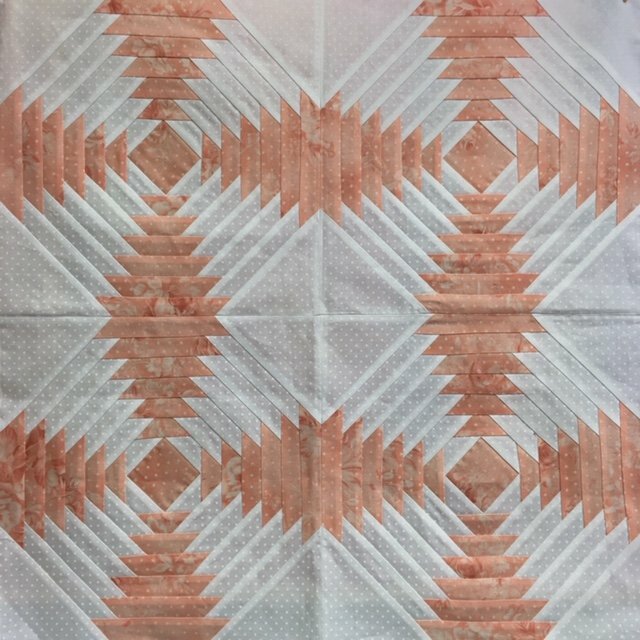 A limited amount of mixed starch is available at Experience Quilts!. Bloc Loc Pineapple Ruler, size 1 1/2 inches; 1 1/2 yds each of two contrasting fabrics of your choice (see fabric requirements); Sewing machine in good working order (don't forget your power cord and foot pedal); New needle (size 12/80 or 14/90); Cotton thread: neutral or light gray; 2 bobbins wound with above thread; 1/4 inch foot (recommended) with or without right guide, or another method of achieving an accurate 1/4 inch seam; 45mm rotary cutter, or smaller; Small acrylic ruler; Small cutting mat for use at your station (space is limited); Portable pressing mat and iron for use at your station- recommended but not required; Pins and scissors along with any other favorite sewing tools. Pat Meek is a certified Bloc Loc instructor.